ENDODONTICS. 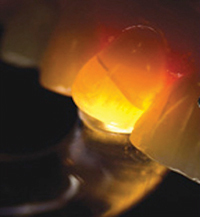 ﻿﻿﻿﻿﻿Lisa Germain, DDS, MScD, discusses the importance of methodical diagnosis in endodontics. I love challenging puzzles. The New York Times Crossword is my favorite, and I have a black belt in evil Sudoku. While each one has its own unique solution, I find that I use the same organized routine to unravel the clues. When presented with more than one potential answer, I narrow it down using a process of elimination. In addition to the facts, I find that logic, intuition, and experience play a significant role in a successful resolution. The differential diagnosis of odontogenic pain can be the ultimate puzzle. Each patient presents with a variable set of signs and symptoms, and from these clues we must identify the disease, the etiology, and then recommend appropriate treatment. This process becomes complicated when multiple problems are present at the same time. In order to differentiate odontogenic pain from other facial pain, a multidisciplinary evaluation must be performed. Eliminating the most obvious causality first will usually lead the way to diagnosis of secondary causes of the patient’s complaint(s). It’s like solving “9 across” so that “12 down” becomes clear. This 2-part article series will present an organized approach to the differential diagnosis of toothache pain. Part 1 will focus on the symptoms associated with odontogenic sources, and part 2 on nonodontogenic sources. By understanding this symptom-based explanation, the clinician should be able to determine the etiology of the patient’s chief complaint and provide the necessary treatment or referral. The key to establishing a chief complaint is to LOVE your patient; Listen, Observe, Verify, and Eliminate. We have all heard the adage, “Listen to your patients. Let them tell you the story of their illness and they will give you the diagnosis.” From this history the onset, duration, and type of pain should be documented. Patients will also reveal a lot if you observe their hand gestures and body language. They will frequently place a hand on the area in question, and you can learn to read the severity of the pain in their eyes. Many times I will reword a question to verify that the information is relevant. If you ask patients if they are cold sensitive, they will invariably say yes. But if you ask them if the pain to cold is recent and associated with their current problem, many times the response will be no; and that their teeth are cold sensitive in general. Once you have all of the information, it helps to eliminate the irrelevant facts. When taking a history, I am often reminded of Sergeant Joe Friday’s famous catchphrase from the TV series Dragnet: “Just the facts, ma’am, just the facts.” If patients start out by telling you that the pain started 20 years ago, when they were walking the dog, you will need to separate the wheat from the chaff. Clinical and radiographic examinations provide an abundance of relevant information, but testing the teeth is essential for confirming cause and effect. Basing a treatment decision on clinical and radiographic examination alone will lead to frequent misdiagnoses. In order to differentiate which symptoms are odontogenic, the pain needs to be reproduced in the offending tooth. Having a patient point to the tooth that hurts is often misleading, due to the complex nature of the innervation in the head and neck. It is common for a tooth to refer pain to another tooth. In general, mandibular molars refer anteriorly to mandibular premolars and maxillary molars refer to mandibular molars on the same side. This phenomenon does not cross the midline. When patients are adamant about an incorrect tooth being the source of pain, I have them hold a hand mirror so they can watch me test the offending tooth. Once they see where it is reproduced, they are surprised, but convinced. Classic tests to help differentiate odontogenic from nonodontogenic pain include thermal, electric pulp tests, percussion, palpation, biting, and transillumination. At least one confirming and reproducible test that corroborates radiographic or clinical evidence of pathology is necessary to make a diagnosis of odontogenic etiology. If the radiographic and clinical examinations are within normal limits, then 2 confirming tests that have reproduced the patient’s chief complaint in any given tooth will yield a reliable and definitive diagnosis and location of an odontogenic etiology. Pattern matching puzzles rely on memory and practice. Each successive challenge becomes more familiar because even though the sequence gets more complicated, the patterns are consistent and repetitive. Like these puzzles, pulpal disease presents in consistent patterns. The source of odontogenic pain can be the pulp and/or the periradicular complex. Pain originating from each of them is perceived differently due to their functional and embryological distinctions. Healthy pulps will feel cold and hot when tested. Once the stimulus is removed, the sensation will not linger. Dentin hypersensitivity is a result of exposed dentin. The reproducible symptoms are sharp, fleeting, intense pain to chemical, thermal, and tactile stimuli. Dental caries that extend into the dentin or pulp can be stimulated by anything — hot, cold, biting, percussion, palpation, and sweet or acidic foods.1 Radiographic and clinical examination will confirm this diagnosis. Reversible pulpitis occurs when a localized irritant such as caries or microleakage cause toothache symptoms. Hyperocclusion and prematurities in excursive movements on restorations can also cause this phenomenon. The patient will have a positive response to thermal stimuli, biting, and/or percussion tests. Once the source of the inflammation is removed, the symptoms abate. Irreversible pulpitis is characterized by lingering pain to thermal stimuli often accompanied with spontaneous pain. Percussion, biting, and/or palpation sensitivity are also common, indicating inflammation in the periradicular tissues. The radiograph will frequently show widening of the periodontal ligament. Pulp necrosis has 2 distinct presentations. The first is characterized by spontaneous throbbing pain and no response to thermal stimuli and electric pulp tests. A localized, diffuse swelling and palpation sensitivity are often present. The radiograph, while sometimes inconclusive, will usually show periradicular pathology, and the tooth will be tender to biting and/or percussion corresponding to inflammation in the periradicular tissues. Before search engines and YouTube tutorials, there was Rubik’s Cube. Still popular today, the solution to this mechanical puzzle depends on a sequence of moves that in turn have a desired effect on the cube. I was baffled for a long time by this puzzle and its solution. I discovered some time later that my problem was that I was looking for a single resolution, when in fact it has multiple solutions that depend on the interrelationship of the surrounding cubes. Erno Rubik (Hungarian architect and creator of Rubik’s Cube) was quoted as saying, “Our whole life is solving puzzles.” Not unlike the Rubik’s Cube, complex odontogenic etiologies are caused by a sequence of events, not necessarily in the same order each time. And, their solution lies in understanding the interrelationship of all surrounding entities. Often a combination of odontogenic and nonodontogenic myofascial pain associated with temporomandibular joint disorder, cracked tooth syndrome (CTS) frequently eludes diagnosis. The patient will describe a sharp, shooting, fleeting pain when biting a certain way or on a certain type of food. It is often difficult to reproduce the pain to biting because the symptom is inconsistent and does not occur every time the patient bites. Delayed and/or lingering cold sensitivity is often reproduced. Parafunctional habits, such as clenching and grinding are known causes of CTS. It frequently occurs bilaterally, and patients are often plagued with this syndrome in several teeth. When the sharp, shooting, fleeting pain to biting is stimulated, a dull ache can linger afterwards.4 It is difficult to differentiate this ache from spasm of the muscles of mastication that frequently accompany CTS. Recently, I have had enormous success differentiating these 2 entities by administering Botulinum Toxin A (Botox, Dysport, Xeomin) into trigger point areas in the muscles of mastication. Once these tight muscles are relaxed, the patients will invariably experience pain relief for 3 to 4 months. The prognosis for treatment of a complete vertical root fracture is hopeless, which makes proper diagnosis imperative. 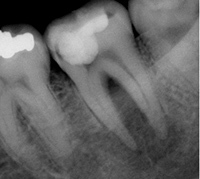 Since it presents with a necrotic pulp and associated periradicular bone loss, it is often misdiagnosed as an alveolar abscess of endodontic origin. If endodontic therapy is performed, it will fail because a root canal cannot seal the leakage along the fracture line (Figures 2a to 2d). 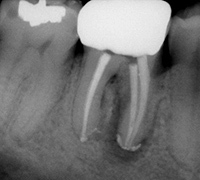 This “endodontic failure” is really not caused by the root canal therapy. 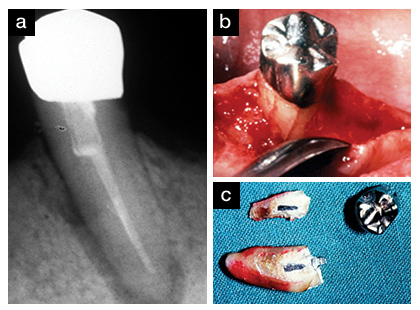 This endodontic failure is actually a “diagnostic failure” and could have been avoided. Figures 2 a-d. (a) Pre-op diagnosis of acute alveolar abscess. (b) One month later. Note rapid bone loss. 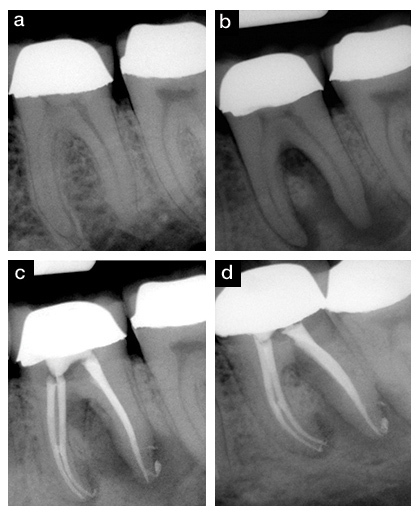 (c) Postoperative radiograph of root canal therapy (RCT). (d) At 6-month re-evaluation with mobility, pocket, sulcular drainage. Depending on the angulation of the x-ray beam, the radiographic appearance of teeth with vertical root fractures will vary in relation to the fracture line and degree of separation of the fragments. When the roots are shattered, and separation of the fragments have occurred, the fracture will most likely be visible on the radiograph (Figure 3). Figures 6a to 6c. Fistula on attached gingiva not of endodontic origin associated with vertical root fracture. 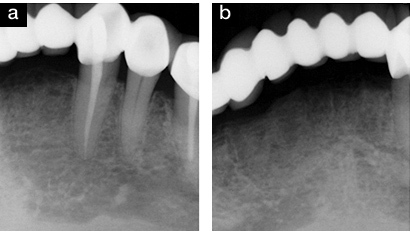 Idiopathic invasive external resorption (Figure 9) is often mistaken for internal resorption or decay. While it is unclear what initiates the process, trauma has been frequently cited. This is actually a disease of the attachment apparatus, not the pulp. 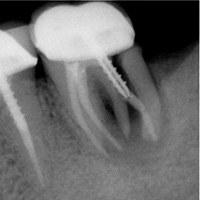 Unlike internal resorption, root canal therapy will not arrest the process. While it is usually asymptomatic, it can be painful, with symptoms similar to an exposure, when it perforates into the pulp chamber. In a dot-to-dot puzzle, a sequence of numbered or lettered dots need to be joined. The dots alone have no meaning. But the total picture is revealed once the dots are connected. When the dots are connected among the 3 sources of odontogenic pain, a triangle is formed. This final picture represents the intricate triad of cause and effect relationships among the 3 entities (Figure 10). Figures 11a to 11c. A 1° endo/2° perio lesion healed with RCT. An acute gingival or periodontal abscess presents with pain similar to a toothache, but it is not as deep seated or throbbing as an acute alveolar abscess of endodontic origin. While odontogenic pain is localized and does not cross the midline, areas with periodontal disease are often more generalized and bilateral. Other characteristics of this disease are gingival inflammation, tooth mobility, localized bleeding, and measurable pocket depths. Radiographic analysis indicates horizontal and/or vertical bone loss from the cemento-enamel junction down the root surface in varying forms, locations, and degrees. It is frequently asymptomatic, and diagnosis is dependent on clinical and radiographic examinations. It is also possible for a patient to experience biting and percussion sensitivity when the gingival tissues are inflamed by impingement from a restoration. Patients report intense pain in these cases, and biting and percussion tests are reproducible. Figures 12a to 12c illustrate the gingival etiology of toothache pain. The patient’s chief complaint was severe biting pain in tooth No. 4 (maxillary second premolar) that was reproducible when tested. The tooth had no response to cold. My initial suspicion was necrotic pulp secondary to a vertical fracture. But, there was no radiographic or clinical indication of bone loss, pockets or mobility. The tooth had no restoration, and the occlusal surfaces did not reveal any marginal ridge fractures. An electric pulp test yielded a positive test that indicated vitality. The only diagnostic clue was clinical evidence of an inflamed papilla on the palatal and buccal surfaces between teeth Nos. 3 and 4. I was surprised to find that the patient had no pain when I probed in that area, and yet his biting response was severe. I made the diagnosis of an acute gingival abscess and treated with a thorough subgingival curretage of the area, prescribed chlorhexidine rinse, and relieved his occlusion. The next day he reported significant relief. Figures 12a to 12c. A 1° endo/2° perio lesion healed with RCT. Pain, tenderness, cusp fracture, incisal edge wear, abfraction, and mobility can be the result of excessive forces placed on the teeth. If the occlusal relationship is not balanced properly, radiographic examination will reveal alveolar bone loss. Patients can experience pain to bite, cold, and percussion. An occlusal examination should be included in a differential diagnosis and prematurities should be adjusted. Parafunctional habits play a significant role in this type of trauma. Figures 13 a-b. Pain from occlusal trauma on a long-span bridge. The “bridge to nowhere” shown in Figures 13a and 13b could not withstand the trauma from occlusal forces placed on the few supporting teeth. The patient’s chief complaint was pain in an edentulous space, but pain to biting and percussion was reproducible on both the abutments and the pontics. The differential diagnosis of toothache pain starts with a thorough history, clinical and radiographic exams, and a battery of tests. At least one confirming, reproducible test that corroborates radiographic or clinical evidence of pathology is necessary to make a diagnosis of odontogenic etiology. If the radiographic and clinical examinations are within normal limits, then 2 confirming reproducible tests are necessary. The infrastructure of all dental diagnosis is demonstrated in the interrelationship among the pulp, periodontium, and the occlusal forces placed on them. Once these are eliminated as the cause for pain, nonodontgenic etiologies must be considered. Part 2 of this article will present the most common entities that mimic toothache pain. Like a jigsaw puzzle, each piece of a differential diagnosis is a small part of the picture. Once the puzzle is complete, the full picture is revealed. West JD. Endodontic diagnosis. Mystery or mastery? Dent Today. 2004;23:80-87. Cohen S, Liewehr F. Diagnostic procedures. In: Cohen S, Burns RC, eds. Pathways of the Pulp. 8th ed. St. Louis, MO: Mosby; 2002:3-30, chapter 1. Schilder H. Endodontic therapy. In: Current Therapy in Dentistry. St. Louis, MO: CV Mosby; 1964:84-109, chapter 2. Cooke HG. Reversible pulpitis with etiology of bruxism. J Endod. 1982;8:280-281. Malcmacher L. Botulinum Toxin (Botox and Dysport) Use for Dental and Facial Pain Treatment. American Academy of Facial Esthetics Web site. facialesthetics.org/esthetics/articles/botulinum-toxin-botox-and-dysport-use-for-dental-and-facial-pain-treatment. Accessed January 23, 2012. Travell JG, Simons DG. Myofascial Pain and Dysfunction: The Trigger Point Manual. Baltimore, MD: Williams & Wilkins; 1983. Cohen S, Blanco L, Berman L. Vertical root fractures: clinical and radiographic diagnosis. J Am Dent Assoc. 2003;134:434-441. Ingle JI, Glick DH. Differential diagnosis and treatment of dental pain. In: Ingle JI, Bakland LK. Endodontics. 5th ed. Hamilton, Ontario, Canada: BC Decker; 2002:259-286, chapter 7. Dr. Germain graduated from Boston University School of Graduate Dentistry with a specialty degree in endodontics in 1981. She is a Diplomate of the American Board of Endodontics, on the Faculty of the American Academy of Facial Esthetics, and a Fellow of the International Congress of Oral Implantologists. Dr. Germain maintains a private practice in New Orleans, La. Disclosure: Dr. Germain reports no disclosures.